Looking for an easy summer sewing project? 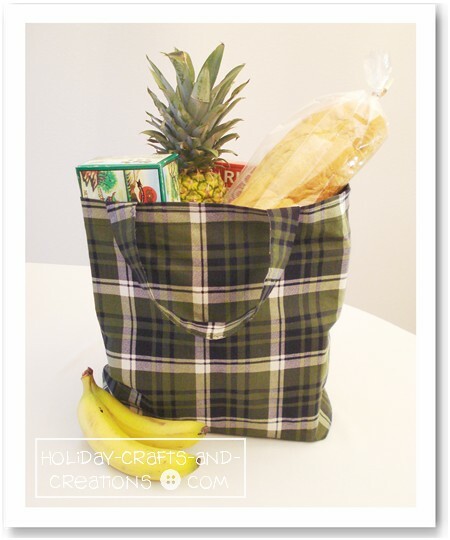 Learn how to make fabric grocery bags with this grocery bag pattern. This pattern is courtesy of the Green Bag Lady Project. The project's mission is to spread the word about using fabric grocery bags instead of paper or plastic. 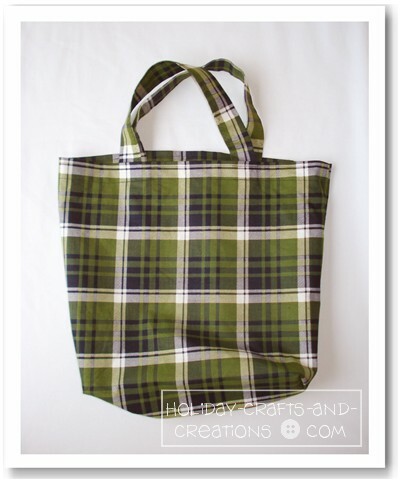 With this shopping bag pattern, you can sew all the bags you will ever need. 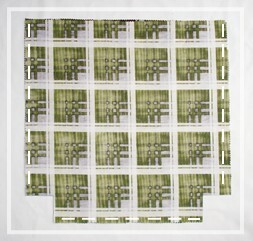 Then you too can make the switch from paper or plastic, to Fabric! So if you like recycled craft ideas, or ways you can help the environment, this would be a great project to try. Note: If you don't have a serger machine you should cut your fabric out with pinking shears so the fabric won't unravel. Cut out two 18" x 18" squares of fabric and mark the top of each square (on the right side of the fabric) at 6 ½" in from each side. This is where the handles will be attached. 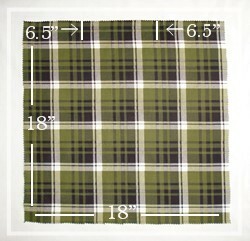 Then place the fabric so the two right sides are facing each other. Now cut a 2 ½" square out of the bottom corner on each side. 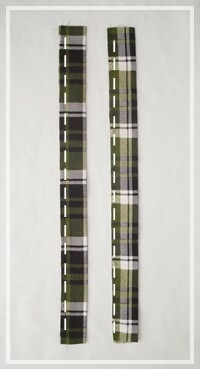 With the right sides of the fabric facing each other, sew ¼" in from the edge, along both sides and across the bottom. Do not sew along the cut-out corners, leave those open. You will now be sewing the bottom corners closed. To get a corner ready to be sewn, open up the bag a little bit. 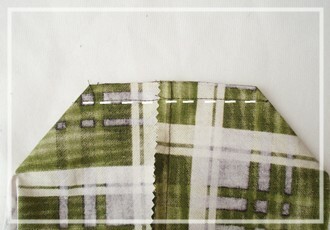 Now on one side of the bag, pinch the fabric at each of the inner corner cuts. One corner from the front of the bag and one corner from the back. 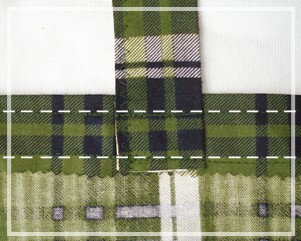 Line up the cut edges and sew about ½" seam. Now cut two strips of fabric that are 3" x 18" for the handles. 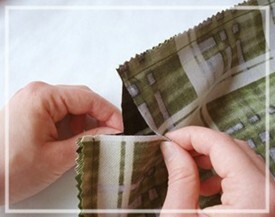 Fold the strip of fabric in half, length-wise, with the right sides facing out. Zig-zag stitch, or serge the open edge closed. Fold over the top edge of the bag about 1" or more, and sew a seam about ¾" down from the top, around the whole bag. As you do this, sew down the ends of the handles at the marks you made in step 1. To reinforce the handles, backstitch over the end of the handle and then continue forward as you get to each handle. 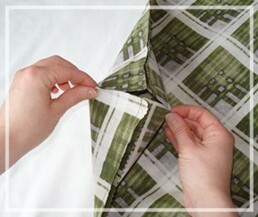 Be sure that the handles are not twisted when sewing them down. After you’ve gone around the bag once, repeat this step again, at about 1/8" down from the top edge of the bag, reinforcing the handles again. Your bag is now complete and you can turn it right side out and go shopping! Hope you enjoyed this easy grocery bag pattern. Be sure to read more about Teresa and her Green Bag Lady Project by reading her interview. Hi Barbara! I'm glad to hear you will be making these bags! But actually it was Teresa VanHatten-Granath who started this project, and she would probably be happy to get your fabric. You can contact her through her website: http://www.greenbaglady.blogspot.com/ Thanks! Thank you for starting this project. I will start making them from this pattern. I have loads of fabric and I will share if you tell me where to send it. Teresa and Kelli. Great job! Love it! I'm impressed at your computer skills esp since you wrote you weren't that into the computer! Love the graphics. Thank you so much! Green Bag Lady Teresa - I love what you are doing! I'm going to make myself several bags. Thanks for the easy pattern! I love it! I should have done a step by step like this a long time ago, now I don't have to! yay! You guys are fabulous!